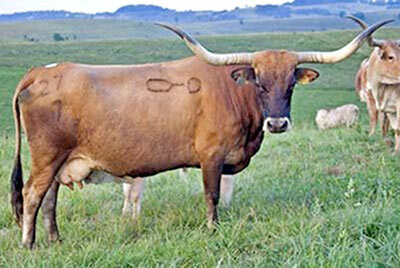 Unattainable - This light walnut colored daughter of Unlimited is out of the old Ranch Lady cork screw horned cow. She raised 13 calves in 13 years including herd sires Steadfast, Yosemite, Light A Shuck, Undeniable, Wince, Set Apart and the grand sire of Drag Iron, Victory Lap. She is still producing for Kevin Bryant at age 18. Some cows are just good and stay good. Some consistently produce better than themselves, some don't.